Specially developed to protect pet rabbits, hamsters, guinea pigs and other small rodents from flies, fleas, ticks, lice and mites. 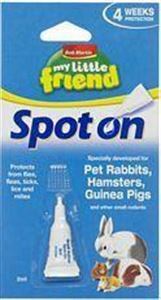 My Little Friend Spot On is convenient and easy to use to protect your small animal from these pets. Please ensure that you use the correct Spot On product on your pet, making sure that the product is specific to the animal. Always read the pack carefully before use. This product is suitable for use on pet rabbits, hamsters, guinea pigs and other small rodents. Correct doses are detailed on the back of the pack.